Although I enjoy eating most meat I’m not a fan of veal at all. Leaving aside ethical concerns about how veal is raised and slaughtered, the fact is, I simply don’t enjoy the taste of it. I didn’t realise that saltimbocca is traditionally made with veal until I decided to make it one day, but after doing some research online I thankfully discovered that a lot of professional chefs believe that saltimbocca is actually far tastier when made with pork escalopes instead. Saltimbocca is an Italian dish that’s very simple to make, but is incredibly rewarding in the taste department. It’s made by wrapping a pork escalope in thin sheets of prosciutto ham and fresh sage leaves before cooking it in dry white wine and butter. I didn’t cook mine with the white wine, but I did make a sage butter to fry the saltimbocca in and I’m really glad I did because I think it really enhanced the flavour of the prosciutto. 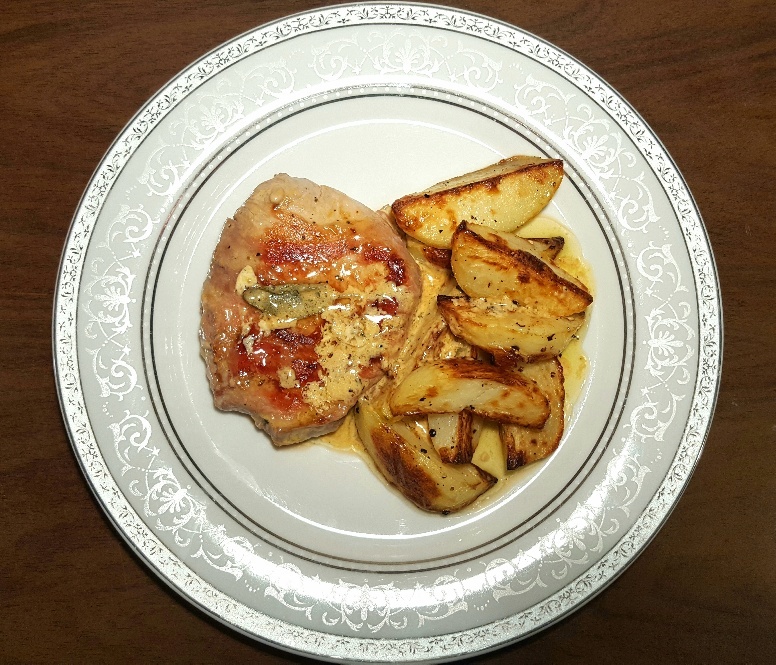 If you enjoy meals made with pork I’d seriously recommend you try making this recipe for saltimbocca because they take very little time to make and are absolutely delicious. 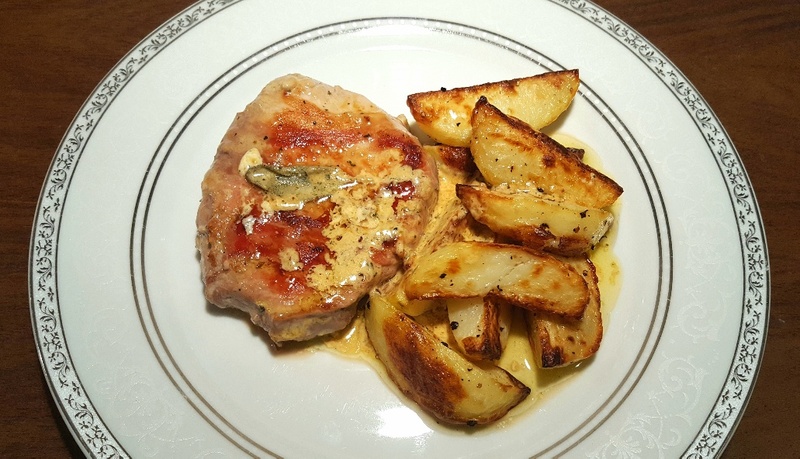 The pork escalopes remain tender and juicy upon cooking, thanks to their wrapper of prosciutto, and they are delicately infused with the woody aroma of fresh sage leaves. I served mine simply with potato wedges, but you could also serve it with pasta, a fresh salad, steamed vegetables or potatoes. It really doesn’t matter, the saltimbocca’s the star of the show. Take 4 sage leaves and chop them up very finely before mixing them into the butter. Leave to one side. Place 2 sage leaves on each pork escalope and then wrap each escalope in two pieces of prosciutto to form a parcel. Put a large frying pan over a medium heat and add the vegetable oil before placing the saltimbocca into the frying pan. Cook the saltimbocca for 7 minutes on one side and then turn them over and cook them for another 6-7 minutes. Add the sage butter and let it cook for another 1-2 minutes before serving drizzled with the melted butter and your chosen accompaniment.